Sophomore wing Drew Lutz scored 14 points to lead four Penn scorers in double figures, and the Kingsmen rolled to a 66-37 victory against Bremen in Northern Indiana Conference high school basketball. Senior point guard Brian Doslak scored 12 points, and senior post Connor Schneider and sophomore wing Noah Applegate scored 10 points each. Penn almost had five players in double-figure scoring, as Riley Smith scored nine points. Penn bolted to a 13-0 lead, and led 20-6 after one quarter. Penn connected on 27-of-48 shooting (56 percent), including 5-of-10 three pointers. Bremen was 14-of-36 (38 percent) and hit 6-of-15 from 3-point range. Penn owned a 29-16 rebounding edge, including a 10-3 advantage in offensive rebounds. That helped the Kingsmen to a 12-2 margin in second-chance points. PENN 66: Drew Lutz 14, Connor Schneider 10, Noah Applegate 10, Brian Doslak 12, Riley Smith 9, Noah Krathwohl 8, Stuart Feeley 3, Beau Ludwick 2, Matt McCown 2, Luke Carlton 0, Drew Schneider 0. BREMEN 37: Chandler Snyder 14, Zach Burkholder 6, Dominic Lopez 5, Jacob Strehler 4, Brooks Feldman 3, Matt Box 3, Cole George 2, Ryan Caldwell 0, Bryce Ginter 0, Grant Klockow 0, Bryce Sterling 0, Jacob Wunder 0. 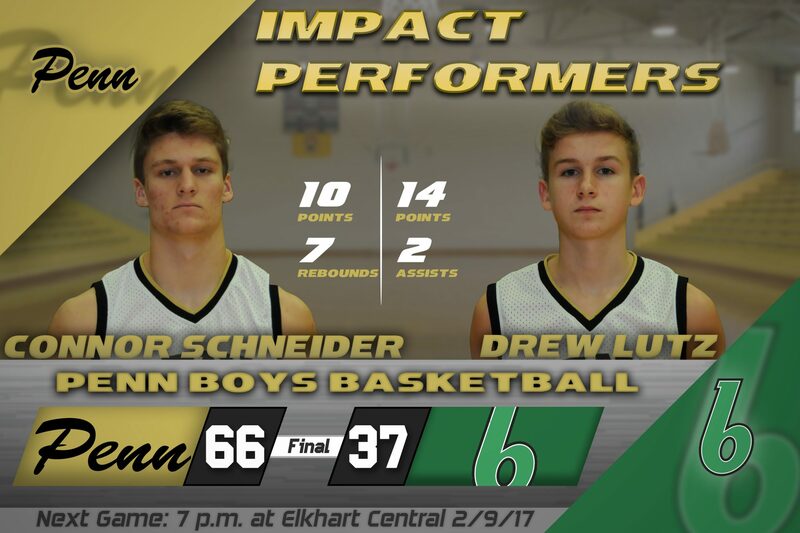 Three-pointers: PENN 5 (Lutz 2, Doslak 2, Feeley 1), Bremen 6 (Snyder 4, Lopez 1, Box 1).